3D Bioprinting and Nanotechnology in Tissue Engineering provides an in depth introduction to these two technologies and their industrial applications. Stem cells in tissue regeneration are covered, along with nanobiomaterials. Commercialization, legal and regulatory considerations are also discussed in order to help you translate nanotechnology and 3D printing-based products to the marketplace and the clinic. Dr. Zhang’s and Dr. Fishers’ team of expert contributors have pooled their expertise in order to provide a summary of the suitability, sustainability and limitations of each technique for each specific application. 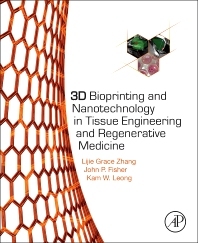 The increasing availability and decreasing costs of nanotechnologies and 3D printing technologies are driving their use to meet medical needs, and this book provides an overview of these technologies and their integration. It shows how nanotechnology can increase the clinical efficiency of prosthesis or artificial tissues made by bioprinting or biofabrication. Students and professionals will receive a balanced assessment of relevant technology with theoretical foundation, while still learning about the newest printing techniques. 16.2. Why is Intellectual Property Important? 16.4. Where does Intellectual Property Law Originate? 16.5. What Aspects of 3D Bioprinting and Nanotechnology are Protectable? Dr. Leong has published over 280 peer-reviewed research manuscripts and owns more than 50 issued patents. His work has been recognized by a Young Investigator Research Achievement Award of the Controlled Release Society, Distinguished Scientist Award of the International Journal of Nanomedicine, and Clemson Award for Applied Research of the Society for Biomaterials. He is the Editor-in-Chief of Biomaterials, and also a member of the National Academy of Engineering.